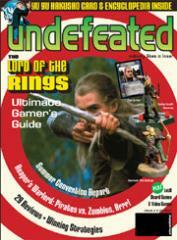 #2 "Lord of the Rings Ultimate Gamers Guide"
Issue #2 of Undefeated magazine explores the world of Middle-earth strategy gaming. The Lord of the Rings game expert Matthew Egan outlines strategies and tactics for The Lord of the Rings TCG, Fantasy Battle Game, Collectible Miniatures Game, and Reiner Knizia’s The Lord of the Rings Board Game. Also, get an inside look at Score Entertainment’s new Yu Yu Hakusho TCG with Undefeated magazine’s exclusive card encyclopedia, featuring all 176 regular cards, game rules, plus Tournament pack cards and exclusive promotional cards. Undefeated editor versus game developer in Warlord, Reaper Miniature’s new game.